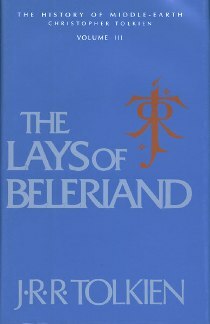 The Lays of Beleriand was the third volume published in the series known as The History of Middle Earth, comprised of the posthumously published tales, notes, and poems of JRR Tolkien. The first two volumes of the series, The Book of Lost Tales, Parts One and Two, covered Tolkien’s unfinished writings up to the very early 1920’s. The Lays of Beleriand follows the next stage in Tolkien’s creation of Middle Earth. In the early 1920’s, during Professor Tolkien’s appointments at the University of Leeds, he abandoned many of the early prose tales of the Lost Tales and began to compose a “lay”, which comes from a Middle English term referring to a narrative poem or song. The first lay Tolkien began, some time in the early 1920’s, was “The Lay of the Children of Hurin”, in alliterative verse. Beowulf, one of Tolkien’s favorite pieces of medieval literature, was composed in the same type of alliterative verse. “The Lay of the Children of Hurin” follows the misadventures of the “Children of Hurin”. Hurin, a member of one of the “great houses” of men, is captured by Morgoth during a battle and refuses to give the Dark Lord the information he demands. In return, Morgoth sets a curse upon his bloodline. “The Lay of the Children of Hurin” is primarily the tale of Hurin’s eldest son, Turin Turambar, a great and valiant warrior, but also tragically haunted and cursed. Tolkien wrote two versions of this lay…both abandoned before the tale of Turin ends, though the first version encompasses nearly three thousand lines. During the year 1925, Tolkien’s life at the University of Leeds was uprooted by his acceptance of a professorship of Anglo-Saxon at Oxford University. During this time, he appears to have completely abandoned the unfinished “Children of Hurin” lay and begun a new poem, this one in rhyming octosyllabic couplets. He called it the “Lay of Leithian” and it told the story of Beren & Luthien, a man and an Elven princess. Tolkien worked on this heroic poem for nearly six years, abandoning it in 1931, at which point was consisted of more than 4200 lines. Tolkien abandoned the poem for more than 18 years, returning to it after his completion of The Lord of the Rings some time during 1949 or 1950. The Lays of Beleriand also includes this version of the poem, “The Lay of Leithian Recommenced”, which started again from scratch and addressed many of the issues Tolkien and other reviewers saw with the original poem. But alas, like the other poems, Tolkien soon abandoned this version as well, several hundred lines in. The Lays of Beleriand also includes a few other small fragments of poetry related to the Middle Earth mythologies dated during the same time period (1920-1925) that the “Lay of the Children of Hurin” was from. These pieces are all very fragmentary and are reproduced in their entirety. The History of Middle Earth is continued in volume four with the The Shaping of Middle Earth.